Fine Art Limited Edition of 50 - Steam is water in the gas phase, which is formed when water boils. Steam is invisible; however, "steam" often refers to wet steam, the visible mist or aerosol of water droplets formed as this water vapour condenses. At lower pressures, such as in the upper atmosphere or at the top of high mountains, water boils at a lower temperature than the nominal 100 °C (212 °F) at standard pressure. If heated further it becomes superheated steam. Photo © copyright by Aaron Reed. The most incredible finished gallery quality pieces that I offer are original photo prints under acrylic glass produced with LUMACHROME HD technology. This industry leading, gallery quality printing process begins by producing a photographic print that is then face mounted from behind to a sheet of crystal clear acrylic glass. The light that is reflected off the print is visually "trapped" within the acrylic glass and when properly lit, appears to be illuminated or back-lit. These prints have a silver, almost pearl-like luminescence that adds to the overall luxury feel of these incredible pieces. As various qualities of changing light fall across the walls of your home, the luminescence of the art changes as well bringing the art to life before your very eyes. My Lumachrome HD Prints are finished with a ROMA Hand Made Italian float mount on the reverse and ship with a French cleat for effortless hanging on delivery. * Free shipping for all U.S. orders! Please contact me for international shipping fees. Please allow 3-4 weeks for production and delivery. The ultimate Museum Quality pieces that I offer are Lumachrome HD Acrylic Prints externally finished with handmade ROMA Tabbachino Dark Ash Italian wood frames and linen liners in your choice of color. 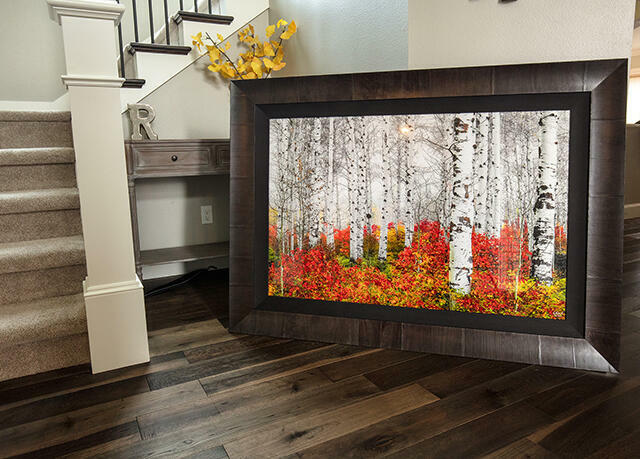 This external framing option adds an incredible luxurious look and feel to your fine art piece with breathtaking results. Framed pieces are finished with a 3" linen liner and a 4" beveled frame adding a total of 14" to both the vertical and horizontal dimensions of the piece. ChromaLuxe HD Metal Prints are produced using Dye-Sublimation technology to infuse inks into specialized aluminum plates that have been finished with a fine multiple layer polymer. ChromaLuxe’s archival qualities, image brilliance, and durability set it apart from all other photo print mediums and provide excellent image clarity and contrast. My ChromaLuxe HD prints are finished with a float mount and wire system on the reverse for effortless hanging on delivery. No exterior framing is required. * Free shipping for all U.S. orders! Please contact me for international shipping fees. Please allow 2-3 weeks for production and delivery. ChromaLuxe HD Metal Prints are produced using Dye-Sublimation technology to infuse inks into specialized aluminum plates that have been finished with a fine multiple layer polymer. ChromaLuxe’s archival qualities, image brilliance, and durability set it apart from all other photo print mediums and provide excellent image clarity and contrast. For those looking for a fully finished piece, I offer ChromaLuxe Metal Prints externally framed with 3.25" Larson-Juhl Olive Wood Moulding and 2" linen liner with four color options. FujiColor Crystal Archive Silver Halide DP II is Fujicolor’s leading photo paper for gallery prints. This photo paper has an extremely wide color gamut, and is rated colorfast for 75 years. Designed for professional use, it provides exceptional sharpness, vibrant color reproduction, excellent image stability and beautiful shadow detail and contrast. As my most affordable, ready to hang gallery presentation print, this Lambda Print on Fuji Crystal DP II meets the most demanding standards. The combination of ultra-modern laser technology, traditional photochemical development, and the renowned, high-end photo paper from Fujicolor offers an incredible vibrant print at a more affordable price point than the acrylic face mount prints that I offer as my premium product. These traditional fine art prints are available in sizes ranging from 24" to 60" wide. 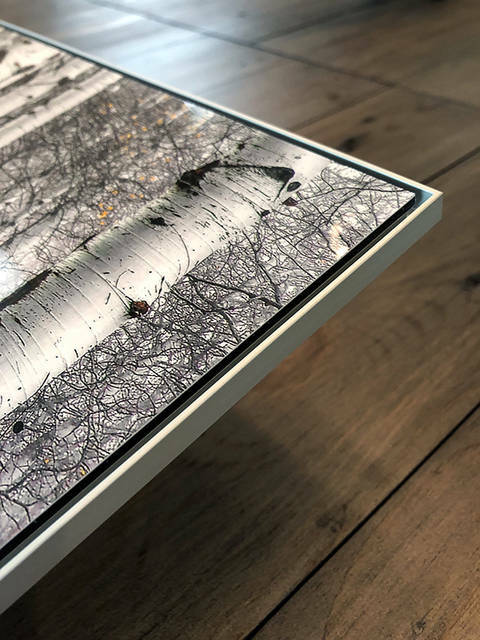 Each print is surface mounted to premium DiBond Aluminum and sealed with a UV-Protective laminate available with either a luster (non reflective) or glossy surface coating. This sealed piece is then finished with a float mount on the reverse creating a ready to hang work of art. * Free shipping for all U.S. orders! Please contact me for international shipping fees. Please allow 1-2 weeks for production and delivery. My name is Aaron Reed and I want to thank you for your interest in my work. 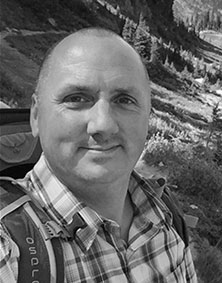 I am a self-taught fine art landscape and nature photographer specializing in large format, museum quality limited edition photographic prints with a broad base of collectors and fans around the world. 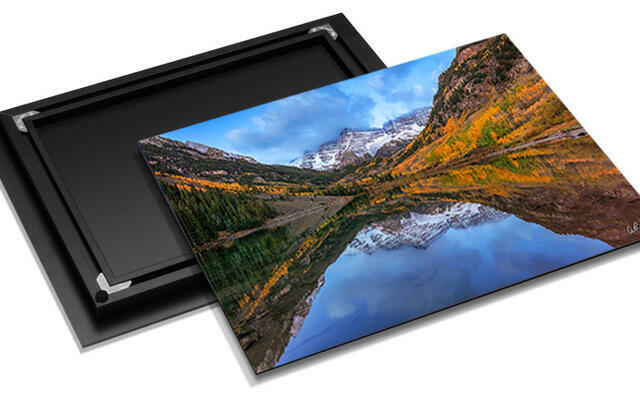 From FujiFlex Silver Halide and ChromaLuxe Dye Sublimation Aluminum to Museum Quality Lumachome Acrylic Prints, you can rest assured knowing the entire body of work on this site is produced using the finest gallery quality materials available today. 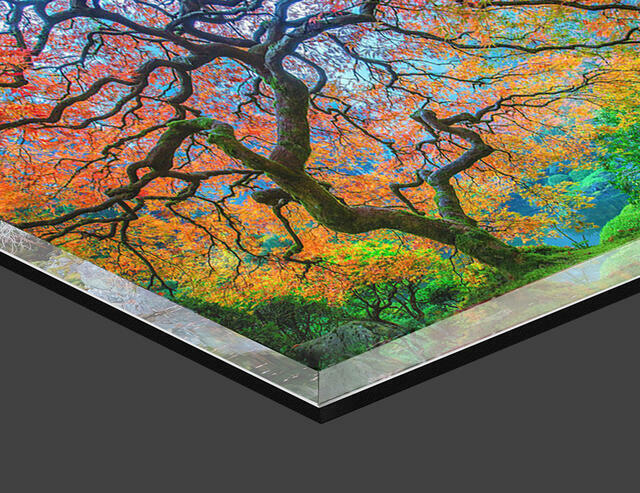 ChromaLuxe and Lumachrome Prints are both finished frameless offering a modern, crisp display that looks striking in any home or business environment. For the ultimate in luxury art, externally framed pieces meticulously crafted using handmade Italian ROMA moulding are also available. All material © copyright by Aaron Reed. All rights reserved. Site by WideRange Galleries.